It’s nothing like the poker you played at the family parties in your uncle’s basement . Texas Hold’em poker is without doubt the most popular table game to be found in the casino. From live action games to the mega prize money in tournament play, almost overnight, Texas Hold’em has become a household word if not the household game. If you are new to the game or just finally ready to learn how the game is played, your instruction is just a click away. Email The Professor to schedule your lesson. Hourly Rate: $125 per hour with a minimum of two hours. Michael, thank you for the poker and metaphysical lessons. They were fun and informative. I felt that they will help my poker game next time I play. That was a good deal. I won another sports bet after you left so I paid for your class that way. See you soon one day. 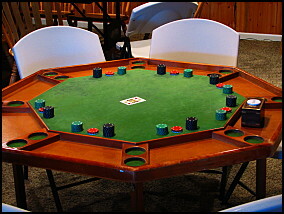 Craig – 4/2012 Why is Playing Texas Hold’em different from other casino games? The biggest difference is there is no house advantage. Players match skill, wit, cunning, and the luck of the draw when playing Texas Hold’em poker. Now, I’ll let you in on a little secret. When it comes to poker, it seems many players playing poker are not much different from those playing blackjack and craps. A lack of knowledge is a common thread. The mistake is failing to invest in themselves to acquire the necessary knowledge for successful play. Simply being male is not a qualifying trait to be a skilled poker player. By learning proper technique, Texas Hold’em offers the knowledgeable player a much better game for positive results. What makes poker a better game? No house odds like the ones found in craps and blackjack. You are in a true zero sum game where the advantage lies with the best player. At first glance, Texas Hold’em, may appear to be a simple card game that follows the same rules of most poker games. This is only true for the ranking of winning hands. However, the strategy for Texas Hold’em is much more complicated. The order of play, the starting hand pre-flop, the betting, the checking and the raising are all more than just procedural events. Every move, of every player, is to be calculated and scrutinized… especially your own play. The Professor now offers basic lesson in Texas Hold’em for the beginner poker player. You can attend small classes or take a private lesson. Get your game started on the right hand, sign up today! By the way, all the metaphysical lessons that The Professor teaches, are especially applicable at the poker table too! Share the post "Texas Hold’em Poker"